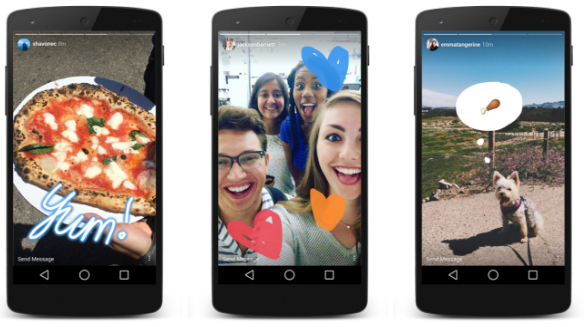 Recently, Instagram launched a new feature that mimics Snapchat: Instagram Stories. With this feature, users can upload photos and videos that will only last 24 hours. This is the antithesis of traditional Instagram, which only focuses on curating photos. However, this new feature proves beneficial for advertisers. After Instagram Stories’ release, numerous brands eagerly tried the new feature, brands such as Mountain Dew, Quaker, Coach, and Nike. Nike amassed 800,000 views within 24 hours of posting its new Michigan football jersey video. Meanwhile, Nike’s best videos attract only 66,000 views on Snapchat. The difference in numbers shows that Instagram Stories have more viewership than Snapchat. But the larger audience isn’t the only reason why Instagram Stories is beneficial to advertisers. Instagram Stories is also more brand friendly than Snapchat. Unlike Instagram, Snapchat targets intimate relationships and private lives rather than public lives. For instance, users cannot like or comment to a post publicly. Additionally, users will have difficulty following accounts because they must know the exact username to add a new Snapchat user. While Snapchat focuses on only the private, Instagram with Instagram Stories focuses on both the public and private. With Instagram’s wider audience and its brand friendly platform, it’a no wonder why businesses are quick to try Instagram Stories.